There is nothing more fulfilling as a music fan than discovering an artist who is completely under the radar, but you known immediately is going to be one of your favorites for years to come. That was the experience many had when discovering the unsigned, and completely-independent Karen Jonas after she released her debut album Oklahoma Lottery in 2014 to much fanfare from the folks who found it, listened, and fell in love with Karen’s songwriting, voice, and unique style of guitar playing. Since then the singer and songwriter has been hard at work on her second album which she hopes brings a bigger spotlight to her music. Aptly named Country Songs, the new record due October 14th was recorded in her hometown of Fredricksburg, VA, and captures songs written in her living room, and recorded live with a hot shot band, helmed by her guitar player Tim Bray and his signature Gretsch guitar. Karen Jonas has just made the record available for pre-order (see below), and to pique your interest, she’s also made the first single and title track available for the album, along with a new video. “Country Songs” speaks right to the heart of what true country music is all about. It’s there to mend the wounds and help us all commiserate over the misery life invariably throws our way. 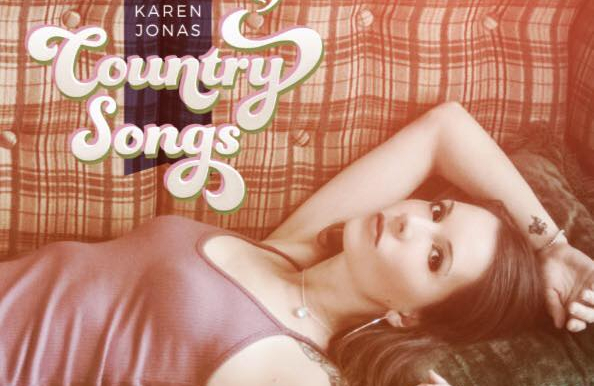 There’s nothing wrong with happy songs either, but country music has always been the best remedy for a sad state of affairs, and Karen Jonas encapsulates this perfectly in this song, while also paying tribute to some of the old greats along the way. Karen’s album Country Songs immediately becomes one of the most anticipated releases for the second half of 2016 (at least in this corner of the internet), and will hopefully catapult her to where her music can get the greater attention it deserves. I’m a huge fan, having discovered Karen this year & seeing her with monster guitar slinger Tim a few times in intimate little venues around Richmond. She’s an incredible narrative songwriter and I can’t wait for the new record. I’ve had the pleasure of hearing a lot of the songs that will be on the album at her live shows. This is going to be worth the wait! I have been waiting for this record for a long time. I discovered Karen Jonas through this website, and the masterful record, “Oklahoma Lottery.” Just preordered! That was a cute song. Best Dwight Yoakam shout-out since MCC’s “I Feel Lucky”! I live a stone’s throw away from Fredericksburg and though I haven’t seen her play yet, I have noticed she’s making quite a splash here locally. When I saw her show calendar had a 7 day a week schedule for two-three months straight, I figured she has quite a future ahead of her. I’m so bummed – Karen Jonas is going to be opening for Brandy Clark at the Birchmere on November 10th – going to be in the DC the weekend before – drats! Saw her earlier this year in NY with a few other songs from the new album – as another commenter said earlier, this album will be well worth the wait, a sure fire album of the year nominee. I love it. Been looking forward to this album all year. I freaking LOVE this woman. Her Kelsey Waldon, Brandy Clarke, Margo Price, and Caitlin Rose… I just adore. And THAT is a GREAT song. Holy smokes! Right up there with all the great song about country songs. Just a nice steady groove to it no excess flourishes or vocal caterwauling, no frills but at thrills. Wow. I love the video and the song. I will definitely be purchasing the 2014 and forthcoming album. Her band actually looks like a country band and not a bunch of hipster douchebags, that’s a win right there! Great song, looking forward to this album. I You-Tubed several of KJ’s videos as I’d never heard of her . Interesting vocalist ..I’ll give her that . But based on what I found she seems to be a one-trick pony in terms of her material thus far . VERY laid back and not very challenging in terms of showcasing any diversity in her style ( Maren Morris , Kasey Musgraves , Miranda all come to mind as folks who CAN show range and diversity ) . You could argue that this is not all that important …however no matter how good / strong / unique a vocalist you are , you need to be able to not only capture but HOLD a listener’s attention over an entire album and , in particular , a live show . Perhaps I just happened to pick the wrong three or four videos from KJ’s collection but I think I’d be falling asleep after the second one . Again ..a lovely voice , terrific country singer and nice material.. but I’m afraid she may get lost in a today’s louder fray . I don’t think Karen Jonas is interest in competing with Miranda Lambert and Maren Morris, and you’re right they probably have more diversity and pizzaz in their live performance because they’re massive mainstream stars. Karen plays coffee shops and maybe hopes someday to sell out theaters. It’s a completely different world. The available YouTube videos don’t give a complete idea of what her live shows are like. There is in fact plenty of diversity, including a strong rocked-out version of Bob Dylan’s “Meet Me In The Morning”. It’s not all laid back stuff! I would also recommend giving her first album Oklahoma Lottery a spin before deciding that she’s a “one-trick pony”. Fair enough Fat Freddy/ Trigger ….perhaps it was a hasty comment on my part based only on the few videos I found . She’s a full-time touring musician, averaging 15-20 live shows per month for nearly three years, mostly headlining clubs, but also opening for bigger country acts like Alabama, Dale Watson and Joe Ely as well as modern Americana artists like The Lone Bellow and Lindi Ortega. Glancing this month’s schedule, I see she’s playing 19 shows in six different states. Seems to me that would be difficult for a one-trick pony to pull off month after month. Thanks again Trigger! Another diamond found on SCM! Just moved to NoVA, so will see if I can catch her live soon. Just picked up both her albums, thanks Trig! Been out of the country (literally and figuratively) on a business trip all week. Catching up on the week’s articles. Being introduced to the Karen Jonas’ of the world is one of the top reasons I keep coming back and hate to miss a review. Gonna buy both records when I get back home. I may have just fallen in love again. Hope my wife’s not reading the site. And the guitar tone coming out of that Gretsch??? And that fiddle lurching up and back in the mix? I’m hooked. Thank you Trigger!